Detail of my colorblocked J. Crew T-shirt. Orange—fiery intense orange—has been growing on me since January when I saw a colorblocked striped T-shirt featuring that color in the J. Crew catalog, then was helped along by Michelle Williams’ lovely Louis Vuitton dress for the Oscars, as well as the Proenza Schouler dress recently on display at The Museum at FIT as part of the exhibit IMPACT: 50 Years of the CFDA. Then I found a great orange nail color by L’Oreal Paris. It’s very bright, almost neon, but I love it anyway. I don’t think of myself as an orange person (unless there’s an Hermès box involved, then I’m very very orange), but this color has me smitten. Are you wearing any orange these days? Michelle Williams in Louis Vuitton at the Oscars, February 2012. I could not get into this dress at first and I think it was because it was impossible to tell the exact color of it against the red carpet. Now I love it, both the color and the detailing, and I think it may have been my favorite dress of the night. A Proenza Schouler dress from 2011, featured recently in the exhibit IMPACT: 50 Years of the CFDA. A close-up of the dress. Notice the lace-like blocks of orange-red. How could I resist a nail polish with this name? Although I guess somebody was hitting the bottle when they set the type for the decal since the ‘n’ in ‘brunch’ is missing. And on a completely unrelated note, if you have a chance, do stop by 33 avenue Miquelon. I gave an interview to the delightful Cameron Miquelon as part of her Follow Friday series, which was not only fun but reminded me that it’s time to get back to my roots, i.e., fashion history, so look for more posts on this topic coming soon. I love the dress on the mannequin!! 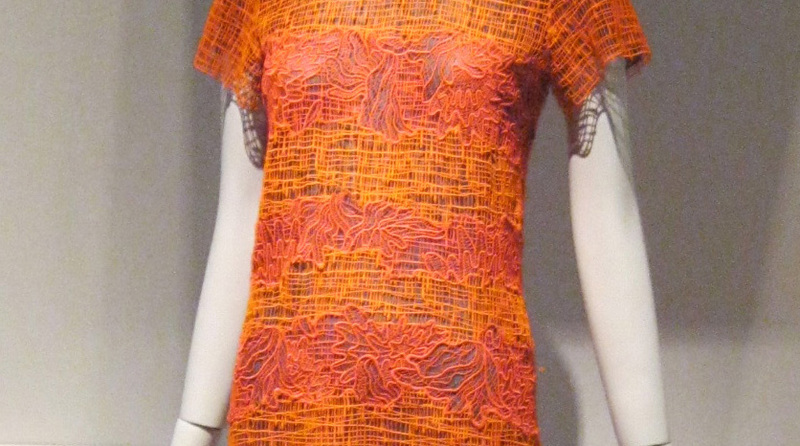 And, anyone who reads my blog knows how I feel about orange, coral, melon...one of my best colors!! I have been told that this is the one color that looks good on ALL women..actually I think I got this from What Not To Wear. Great post, Jill! I like orange especially in cheerful pieces like your stripey tee, but it does not suit me sadly - I do break the rules and wear an orangey lipstick sometimes - I love that dress on Michelle Williams! Hi Veshoevius, orange does not suit me either, at least close to the face, so the stripey tee is perfect since the orange is on the bottom half of the shirt.